In the months leading up to the release of his much anticipated novel, Quent Cordair has begun to publish his short stories on Amazon. The first short story, "A Prelude to Pleasure" is getting rave reviews and has made the #6 spot on Amazon's "Hot New Releases" list. Quent's story can be downloaded for 99 cents to Kindles as well as to computers and smart phones via a free Kindle app. "A Prelude to Pleasure" is the tale of how a man of accomplishment and wealth goes about finding his true love--and what he discovers along the way, with the help of a boy who reminds him of who he once was. One reviewer said, "The characters are nicely drawn and the dramatic tension unfolds according to a clever, inexorable logic: Will the hero ruin his life with a bad decision -- or have the courage to make the right decision?" Quent will be publishing many of his short stories on Amazon over the coming months. This one is sure to wet your appetite and leave you wanting more. If you enjoy the story, please leave Quent a review on the Amazon page. 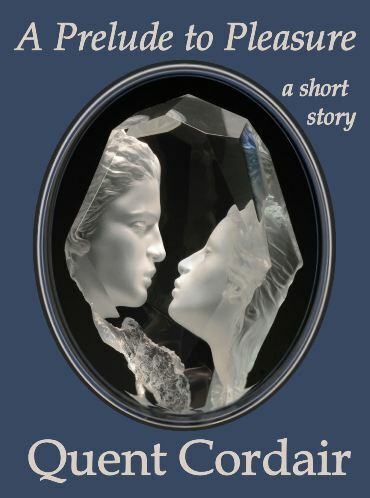 Quent Cordair's newest short story, "Sheltered" has debuted on Amazon and is available for only 99 cents on Kindles. It can also be downloaded to computers and smart phones using the free Kindle reading app. In “Sheltered,” the timely short story by Quent Cordair, one man follows his own course in response to growing fears of impending disaster and societal breakdown. Enjoy the story. There are more on the way!